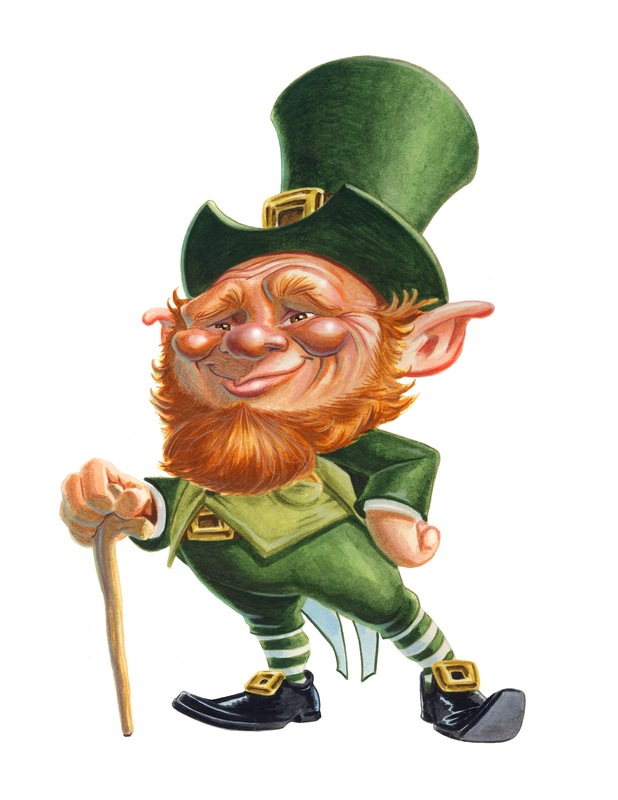 St. Patrick, the patron saint of Ireland, was actually born in Britain. Many miracles have been attributed to the bishop, though his sainthood derives from his conversion of the Irish Celtic pagans to Christianity. He used the native shamrock as a symbol of the holy trinity when preaching and brought the Latin alphabet to Ireland. March 17 is his feast day! 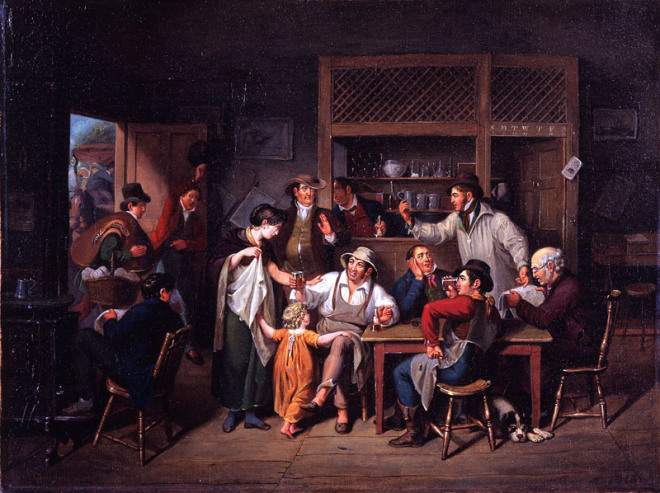 The custom of imbibing alcohol on St. Patrick’s Day derives from old Irish legend. It is said that St. Patrick, on visiting an Inn, was served a measure of whiskey that was considerably less than full. Somewhat miffed he then informed the innkeeper that there lived in his cellar a recalcitrant demon who grew fat on the dishonesty of certain Inn-keepers and in order to banish the brute he must change his ways. 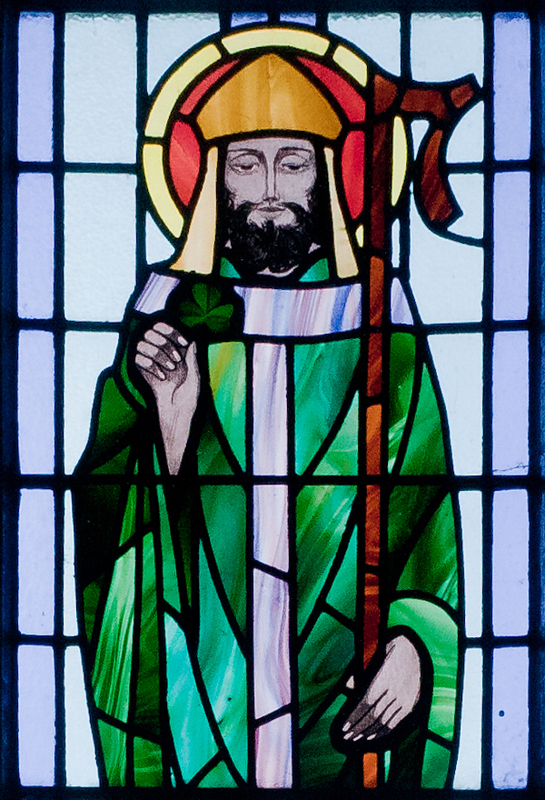 On a return visit some while later St. Patrick found the owner generously filling his patrons’ glasses to overflowing. A subsequent inspection of the cellar revealed, much to his pleasure, a sorely emaciated demon and being well pleased with the landlord’s new-found generosity he promptly banished the wasted creature, proclaiming that thereafter everyone should have a drop of the ‘hard stuff’ on his feast day. 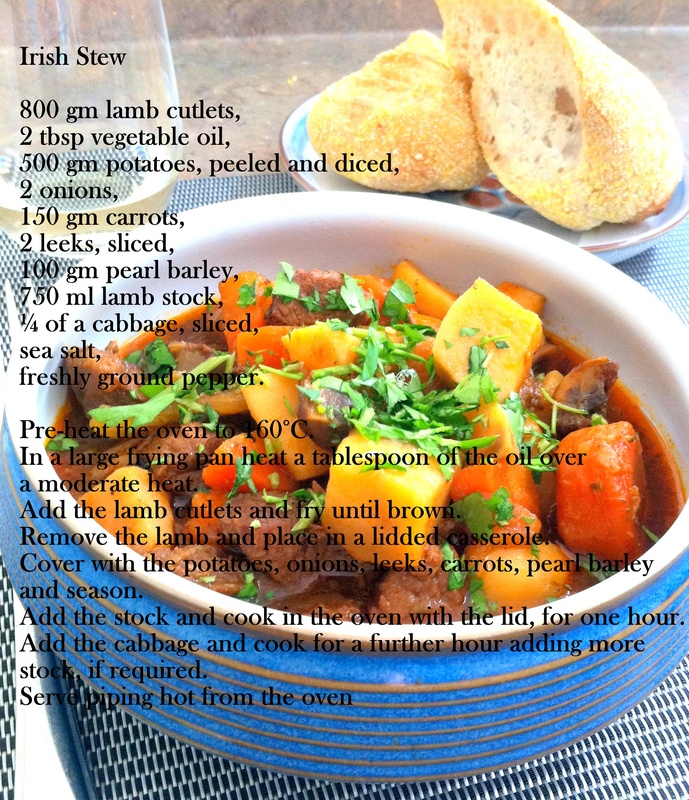 Ireland’s national dish is Irish Stew and being a peasant dish a traditional Irish stew should consist of mutton, potatoes and onions, cooked in a broth made from lamb or mutton neck-bones, shanks, and other trimmings, though in recent times the mutton has been replaced with lamb, and in some cases beef. Controversy still rages over whether other vegetables than just potatoes, onions and parsley should be added. While adding leeks, swede, carrots, garlic and barley can improve the flavour and nutrition of the dish, the choice is up to the cook! The wearing and imbibing of all things green is a symbol of Ireland’s lush green farmlands. 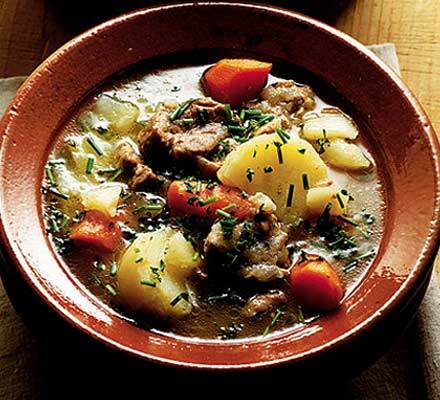 The Irish raised primarily sheep and root crops for subsistence. The sheep provided wool for warm clothing, milk for drinking and making cheese and potatoes were the main food crop, prior to the potato famine. 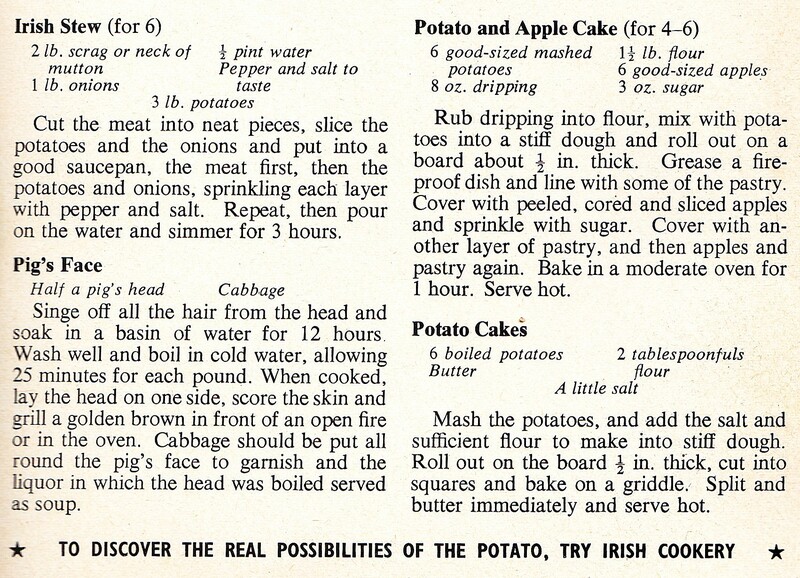 The beef recipe (see below) has evolved to include Guinness, which some argue elevates this traditional ‘food of the people’ to near gourmet status. It not only helps to tenderize the beef, it also gives it a rich malty flavour. 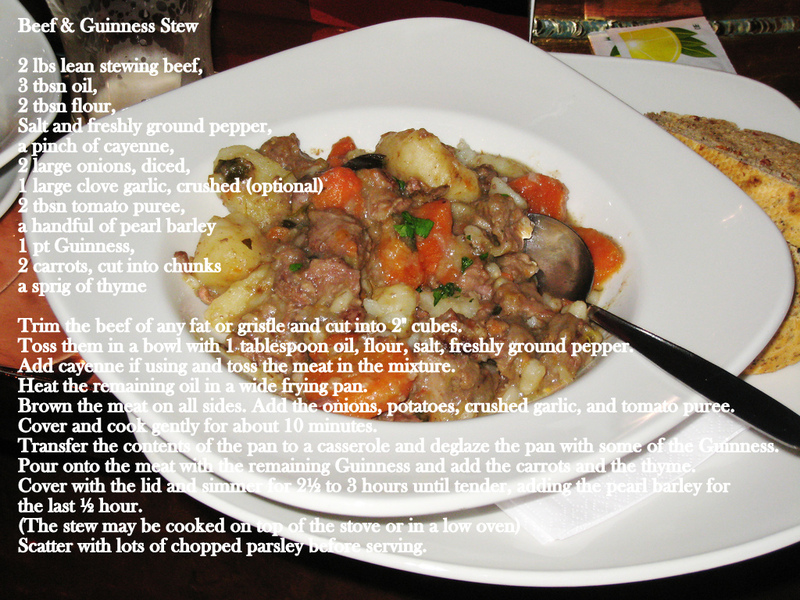 This entry was posted in Meats, World Cuisine and tagged Demon, folk tale, Guinness, potatoes, St. Patrick. Bookmark the permalink.